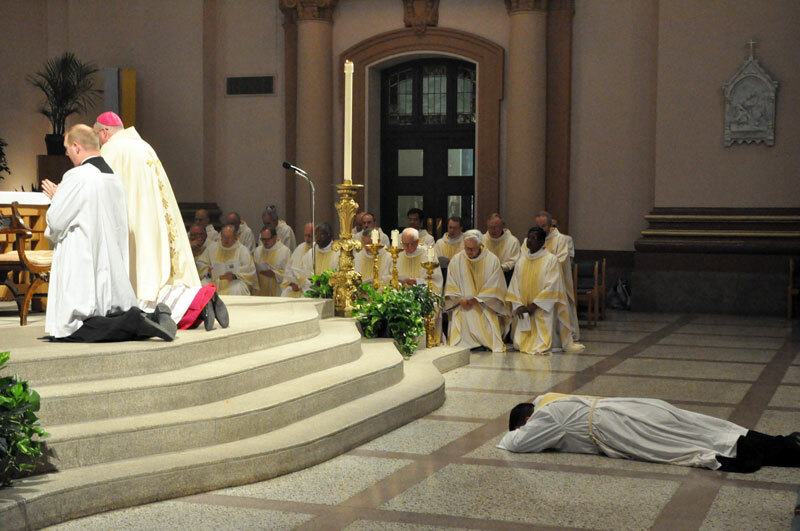 Deacon Jerry Byrd lies prostrate in prayer during the praying of the Litany of the Saints just prior to being ordained a priest on June 2 at SS. Peter and Paul Cathedral in Indianapolis. Also kneeling in prayer are Father Patrick Beidelman, left, archdiocesan director of liturgy; Bishop Christopher J. Coyne, apostolic administrator; and priests who minister at parishes in central and southern Indiana. (Photo by Sean Gallagher) Click for a larger version. “Before I formed you in the womb I knew you, before you were born I dedicated you” (Jer 1:5). Rose Byrd and her son, transitional Deacon Jerry Byrd, reached out and held each other’s hand when they heard these words proclaimed during the first reading of the June 2 Mass at SS. Peter and Paul Cathedral in Indianapolis during which he was ordained to the priesthood. The words had deep meaning for the mother and son. They recalled a courageous choice for life and of God’s plan for Jerry when his life hung in the balance while still in his mother’s womb. When Rose was pregnant with her son 31 years ago, doctors told her that he had Down syndrome and would be very sickly when he was born. They recommended that she have an abortion, a choice that she refused to make. God’s plan for Deacon Byrd was even more amazing considering that he was raised in a family that belonged to a Baptist congregation in southeastern Indiana. It was only after he had a powerful experience of Christ’s presence in the Eucharist in 1998 when he was 17 that he became aware of God calling him into the full communion of the Church. Now, 14 years after that life-changing Mass, Father Jerry Byrd took part for the first time in consecrating the bread and wine, and turning them into the Body and Blood of Christ. “It really proves to me that God had a purpose for my life,” he said. The immediate future for Father Byrd will be as associate pastor of St. Barnabas Parish and Catholic chaplain of the University of Indianapolis, both in Indianapolis. He will begin those ministry assignments on July 3. At the beginning of his homily, Bishop Christopher J. Coyne, apostolic administrator, thanked Father Byrd’s family for forming him in the Christian faith even though they are not in the full communion of the Catholic Church. When Father Byrd stood at the altar during the eucharistic prayer, the power of the change that had just taken place in his life a few minutes earlier when Bishop Coyne ordained him a priest was still sinking in. When concelebrating priests whisper certain parts of the eucharistic prayer, they hold out a hand toward the altar. The journey that Father Byrd took to stand at the altar in the cathedral on June 2 involved many people in his life. One was his sister, Sandy Fox of Bright, who sat next to Rose Byrd in the first row of seats in the cathedral. Father Eric Johnson was just beginning his ministry as archdiocesan vocations director in 2005 when Jerry Byrd came to him inquiring about the priesthood. Father Shaun Whittington also accompanied Father Byrd on his journey to the priesthood from its earliest stages. During the ordination, he helped his friend put on his priestly vestments for the first time. “It’s been a journey inward in some respects to know yourself more fully and to have that deepening conversion of heart,” said Father Whittington, who is pastor of St. Charles Borromeo Parish in Milan, St. John the Baptist Parish in Osgood, St. Mary Magdalen Parish in New Marion and St. Pius Parish in Ripley County.